STV ballots let voters rank their choices, just as Condorcet ballots do. They often look the same. Closed-list Proportional Representation asks a voter to mark his ballots for 1 party. Open-list Proportional Representation may ask a voter to mark his ballot for 1 candidate; that vote counts for both her position on her party's list and for her party's percentage of the votes and seats. These ballots are like ballots for the single-winner plurality rule in that each voter makes 1 mark on his ballot. These ballots ask a voter to mark his ballot for 1 party and also for 1 district rep. There are 2 contests on the ballot and it looks like a ballot for 2 contests under single-winner rules. In most countries with MMP, the districts use plurality elections. A few countries use runoff elections to make sure each district winner has the support of some majority. They could use Instant Runoff Voting to ensure the district rep has the support of a majority. Or they could use a Condorcet rule to elect the local district rep and give the council a larger group of central swing voters - if the party leaders cannot coerce the legislative votes of the district winners. Each of the four main chapters has a page about ballots: Single-winner elections, multi-inner elections (this page), policy votes and budget votes. 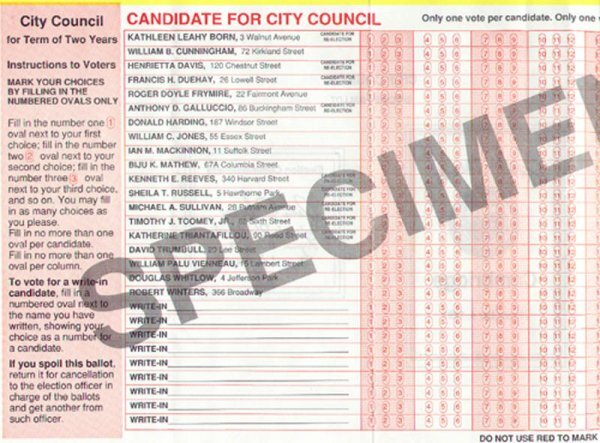 That last one has the most recent ballot design; you simply “drag” the candidates up and down your list.